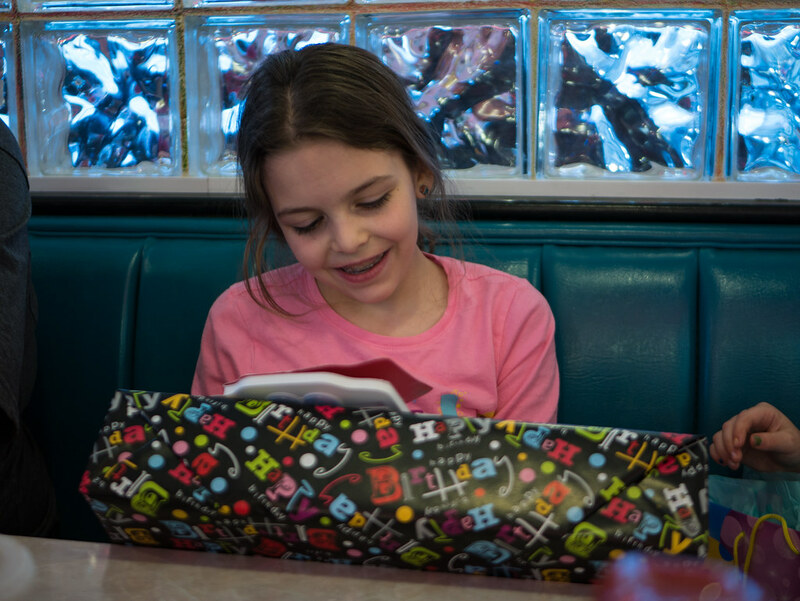 The birthday celebrations continued at Cheeburger Cheeburger, where we got together with Grams, Uncle Scott, Aunt EA, and Charlie. Uncle Scott and Aunt EA included a fun musical card that was a hit. 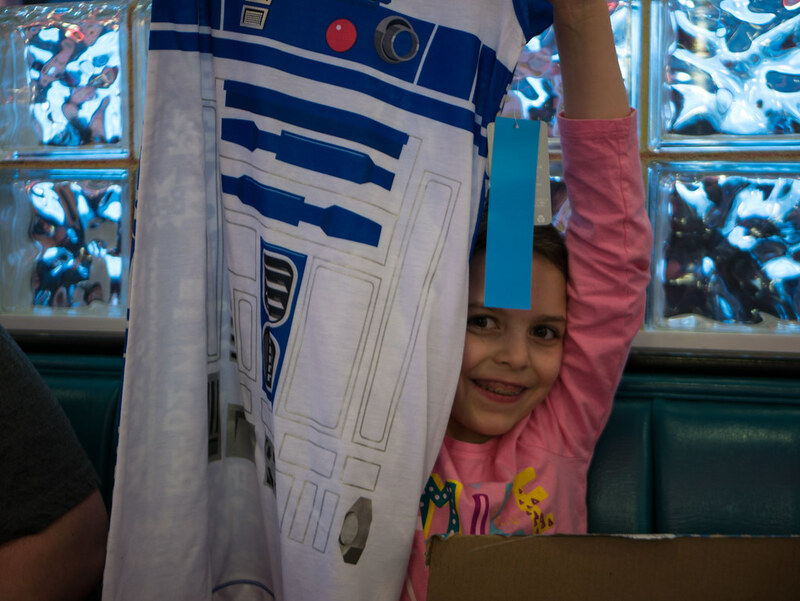 They also gave her this awesome R2-D2 nightgown. 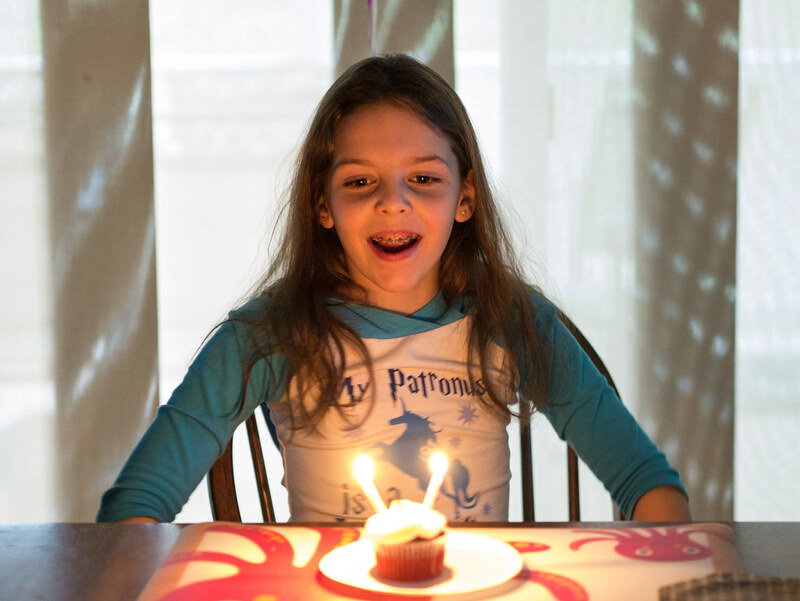 A couple days after her real birthday, the celebrations continued. 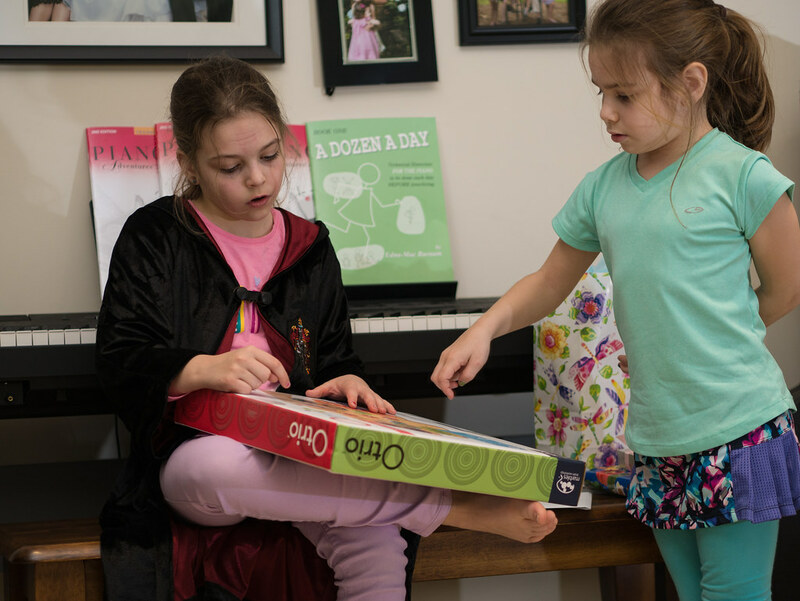 Molly opened presents from G’Mom and Grampa, including a couple of games. The first was Otrio, a strategy game that is kind of a multidimensional tic-tac-toe. It’s lots of fun, and we play it a lot. 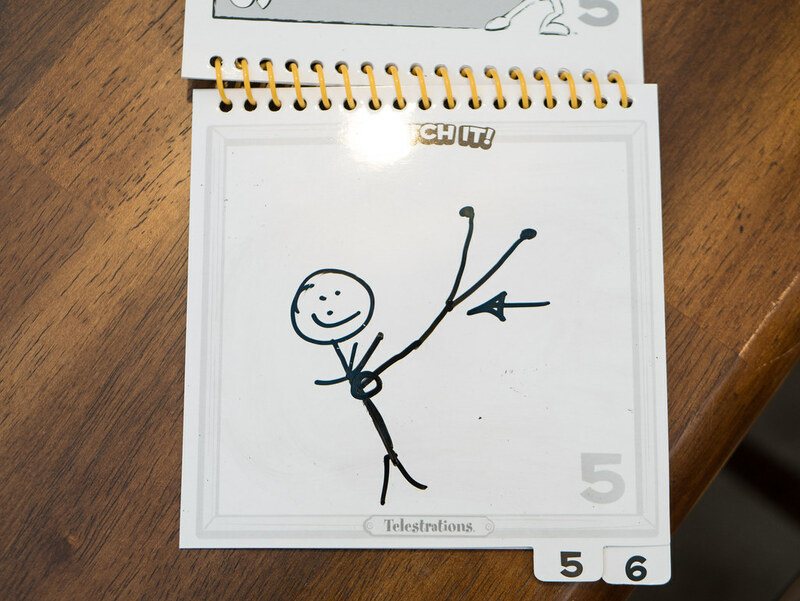 The other game G’Mom and Grampa gave Molly was Telestrations. 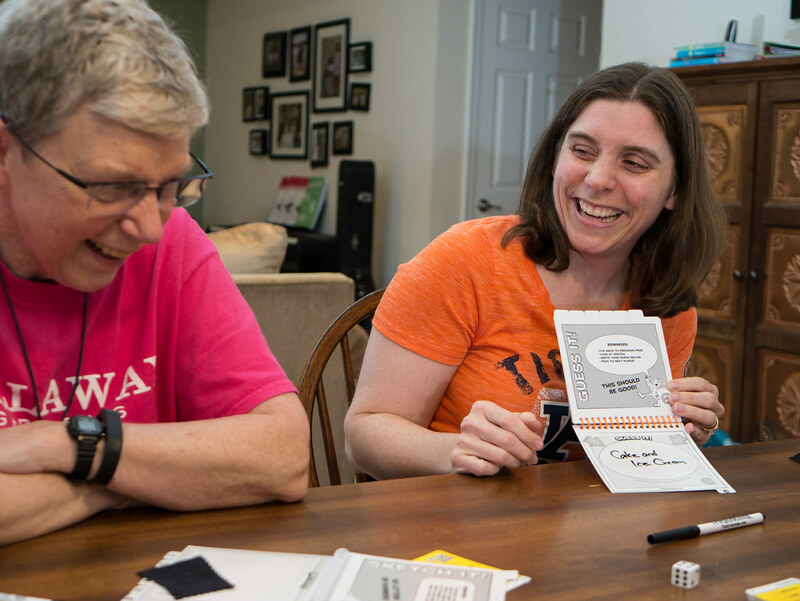 It’s a cross between Pictionary and telephone, where you pass a word around the circle by alternating between writing it and drawing it. 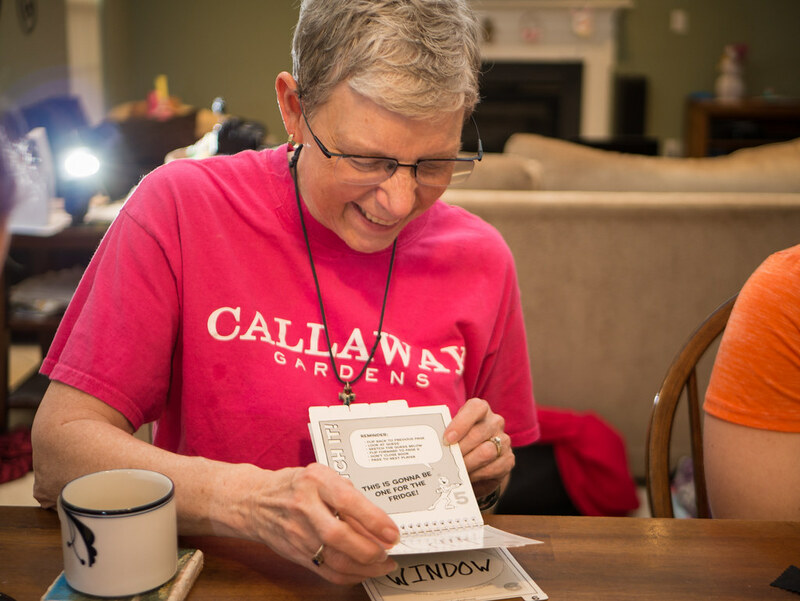 The results can be quite hilarious, as you’ll see from these few pictures of us playing it. 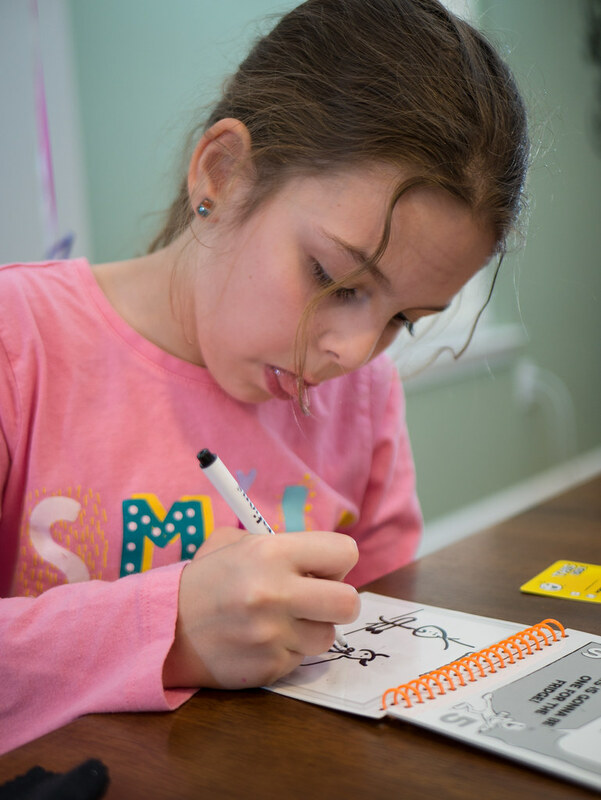 It’s important to stick out your tongue when you draw. As I said, this game can lead to hilarity. Here are a couple of examples of why Jen can’t keep it together. 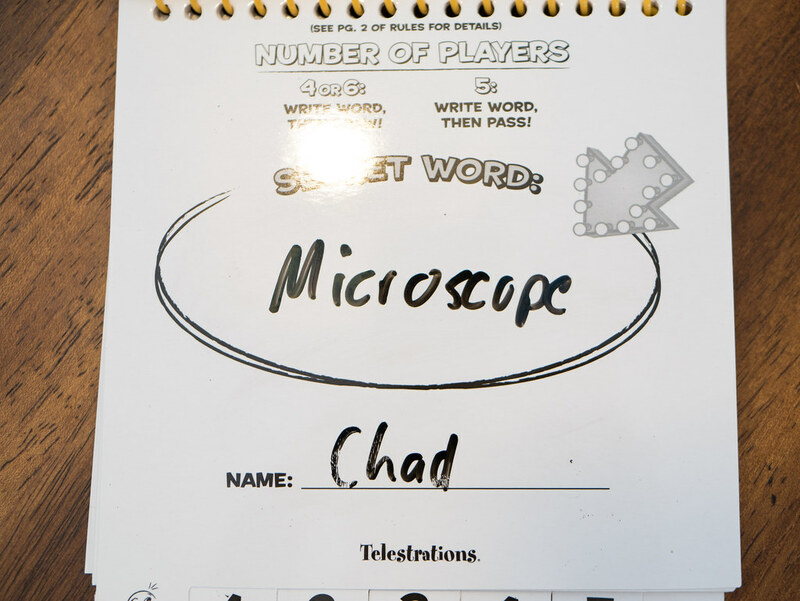 In the first example, I got the word “microscope” and passed that to Leah to draw. Leah confused microscope and stethoscope, and drew this. Which was interpreted to be “legs”. 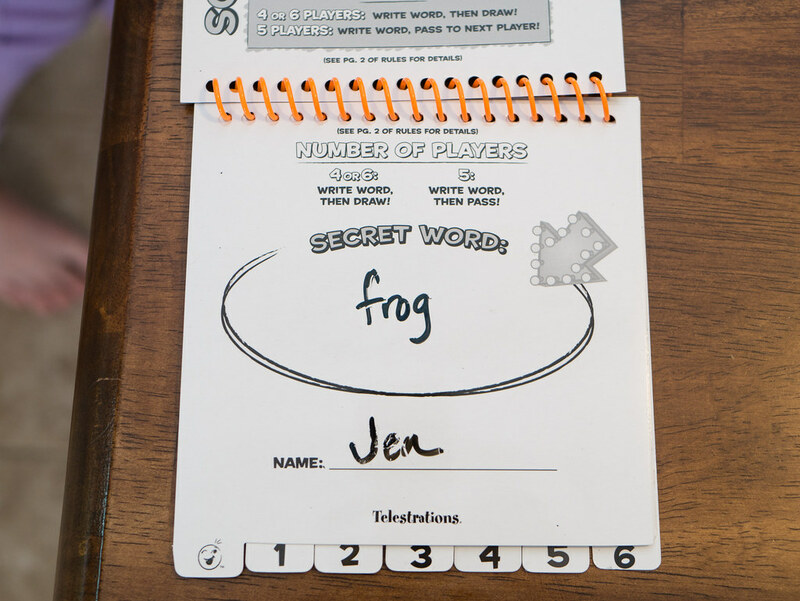 A second example - Jen got the word “frog”. 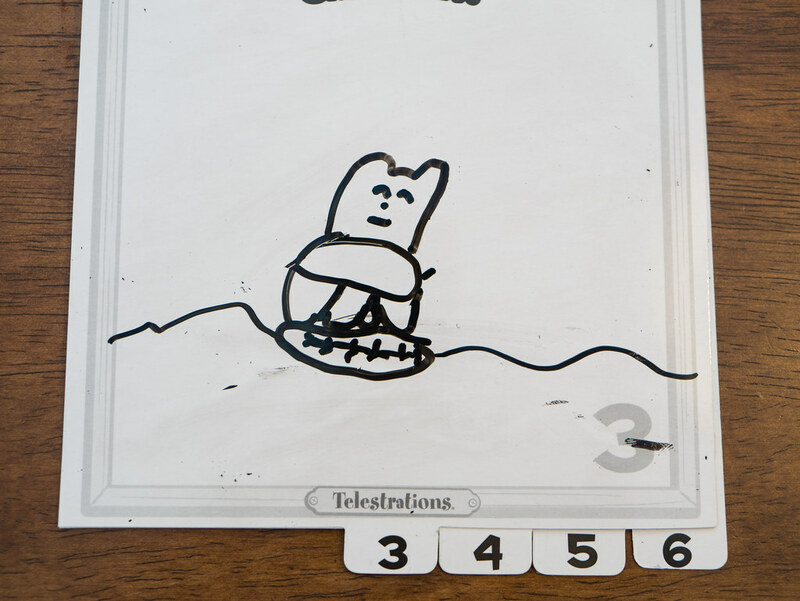 Leah drew this, a frog on a lily pad. I thought the frog on a lily pad looked like a cat on a surfboard. 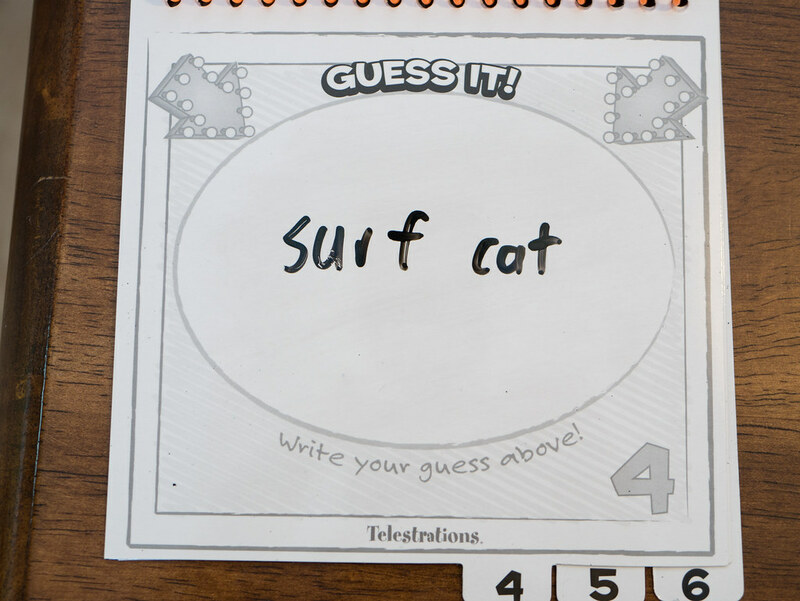 So, I wrote “surf cat” (the obvious answer, I know ;). It’s a really fun game. I highly recommend it. 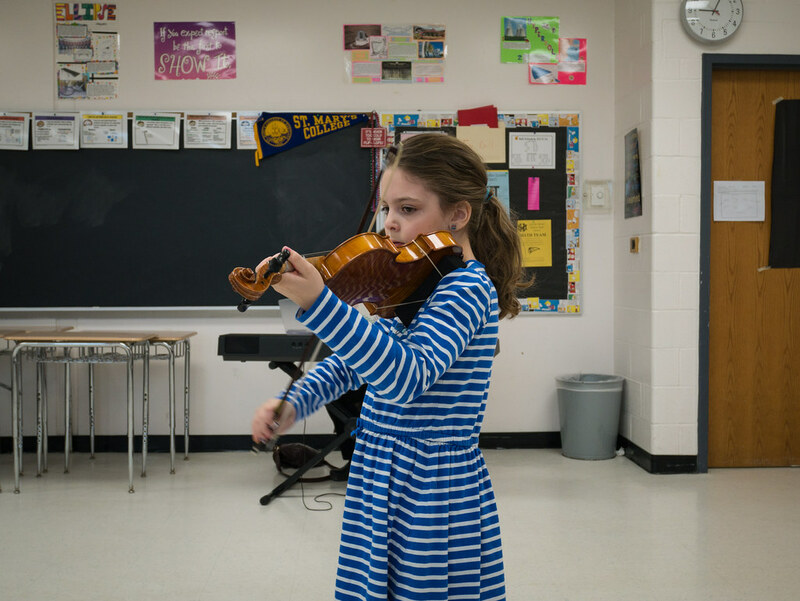 The morning after Bingo, Molly again participated in the countywide Solo and Ensemble Festival. Unfortunately, the judge asked her to start playing before I had even sat down, so I didn't get a recording of the whole thing. But here's a small taste. 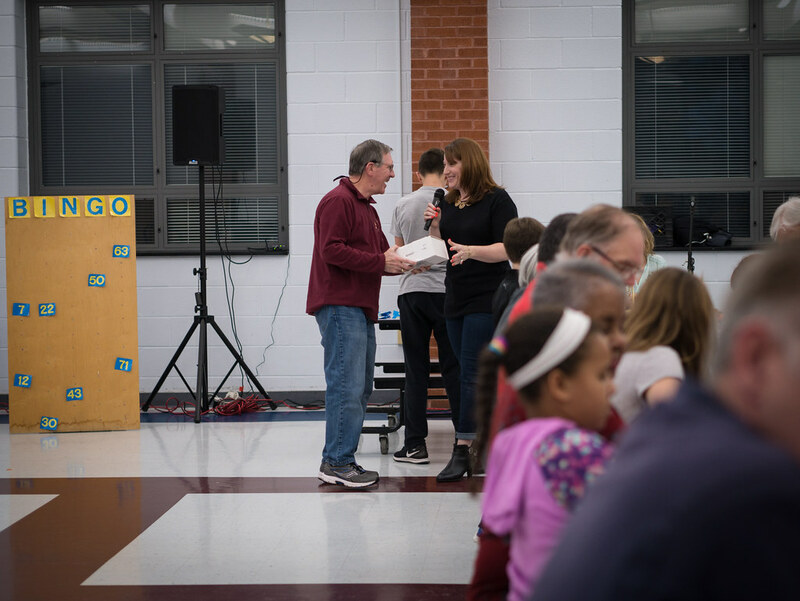 We again attended Bingo night hosted by the girls’ school, and G’Mom and Grampa joined us as they were in town. They were actually in town the weekend before as well, then left to visit friends for the week before returning to spend the weekend with us again. They couldn’t miss Bingo, after all. 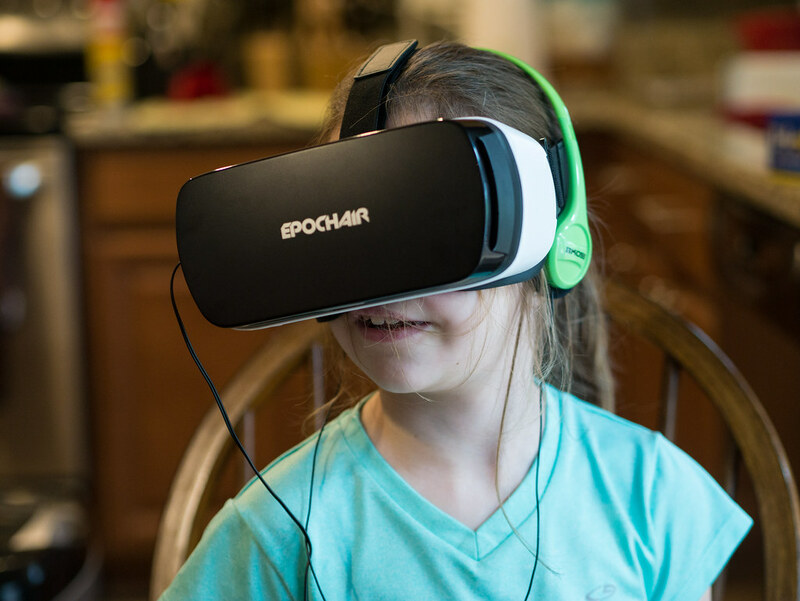 Grampa won one of the rounds, and received some VR goggles as a prize. 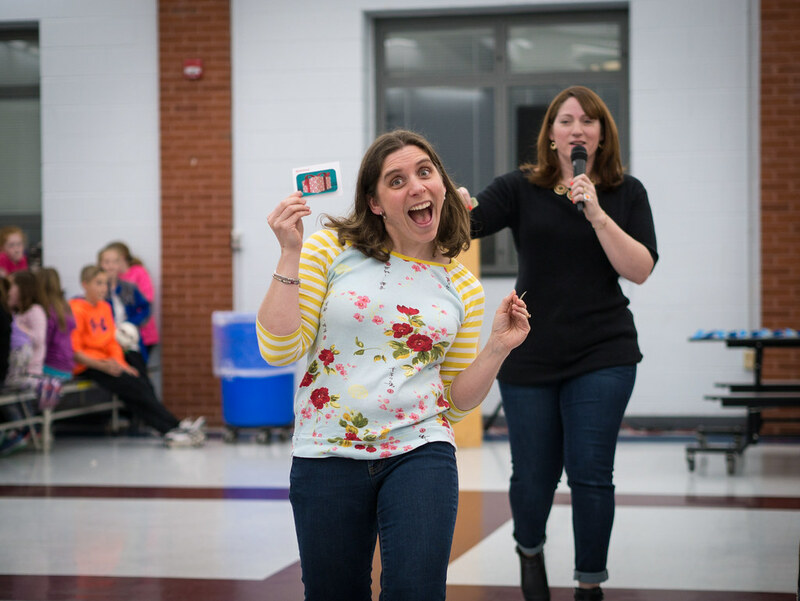 Shortly after Grampa won Bingo, Jen got picked for one of the door prizes - a Target gift card. It was a lot of fun. 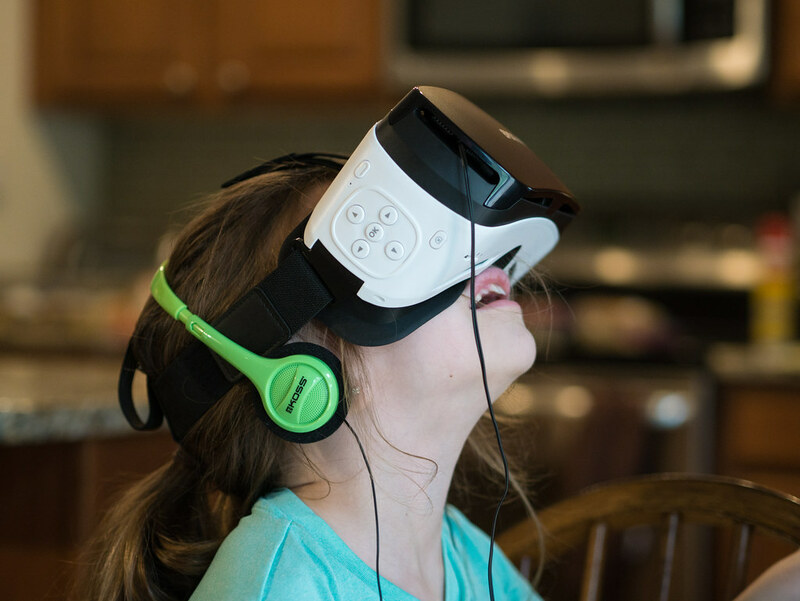 Afterward, Leah and Molly were excited to try out the VR goggles. It was late, of course, but they played with them a bunch the next morning. A few weeks after Leah sang with the band in church, we did the same song again. 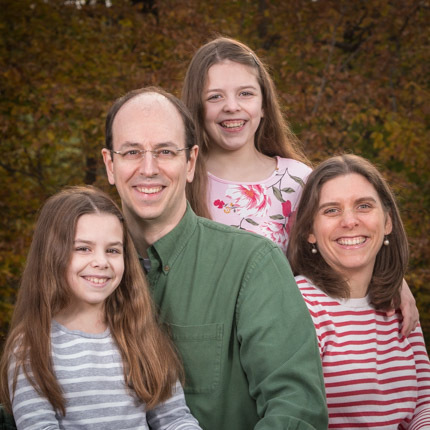 The girls decided it was Molly’s turn to lead with me, so she took the solo that week. 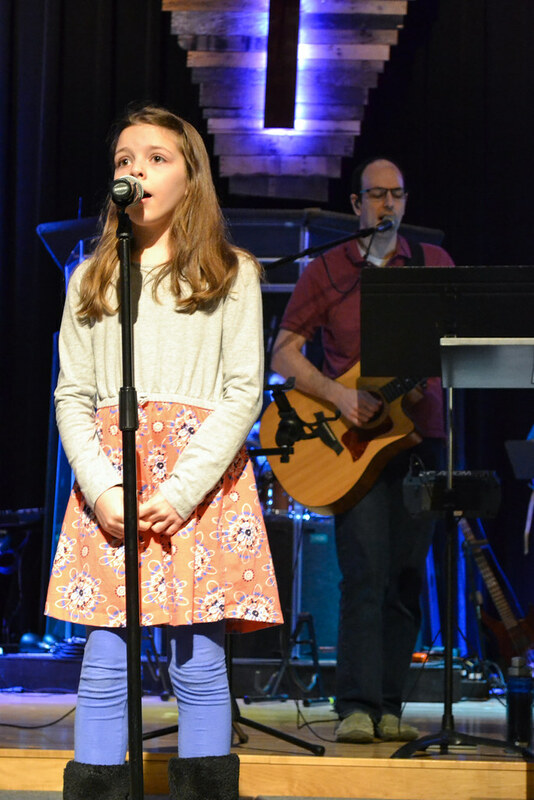 Back in March, Leah sang her first solo in big church and did a great job. Here she is with the praise band, leading the congregation in a new song. I thought I had posted this back then, but I apparently just put it on Twitter. Molly’s actual birthday was a school day with evening activities for both girls, but we still managed to do a little bit more celebrating. 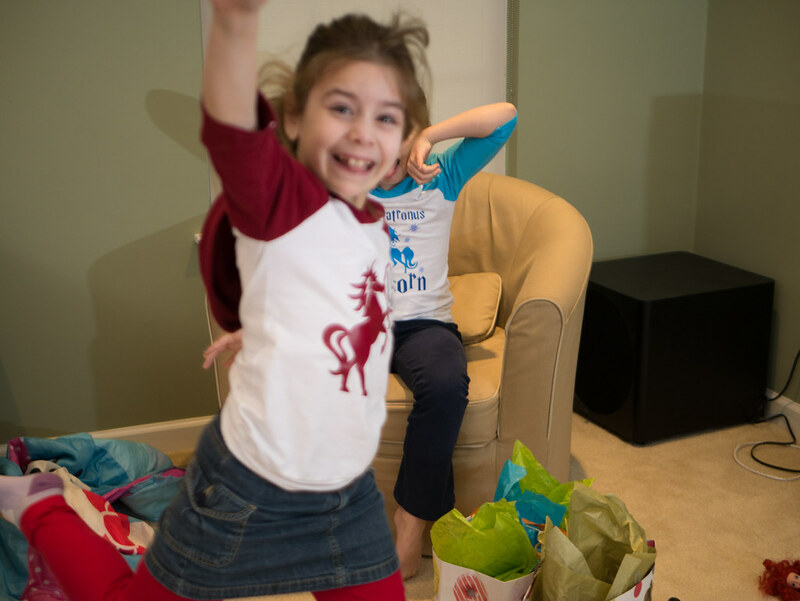 Before opening presents, I tried to get a picture of the birthday girl, but Leah was too quick for me. Sometimes you have to move quickly to photobomb a picture. Ah, there she is. Lovely, Molly. Leah got Molly a bunch of pairs of Shopkins earrings. Molly is a big Harry Potter fan. She’s read all the books, and taken the Sorting Hat quiz (she’s a Gryffindor). 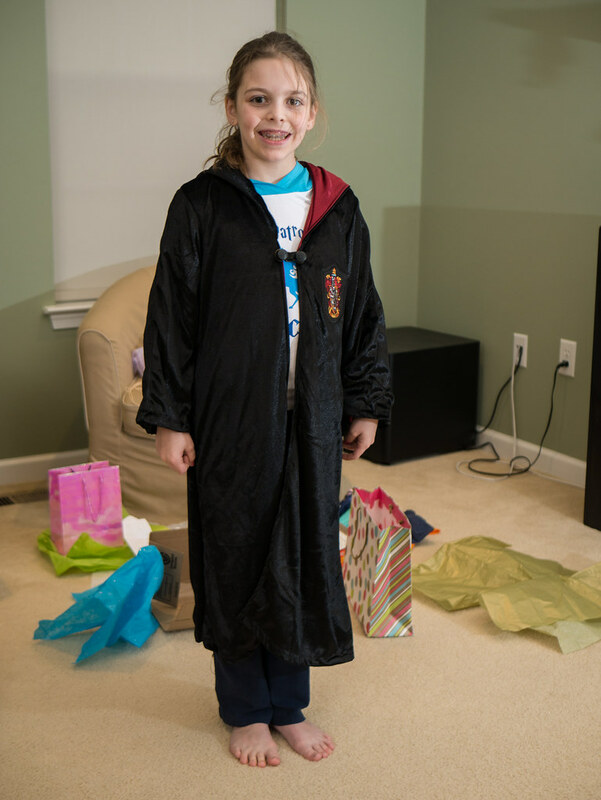 So, we got her a Gryffindor robe. 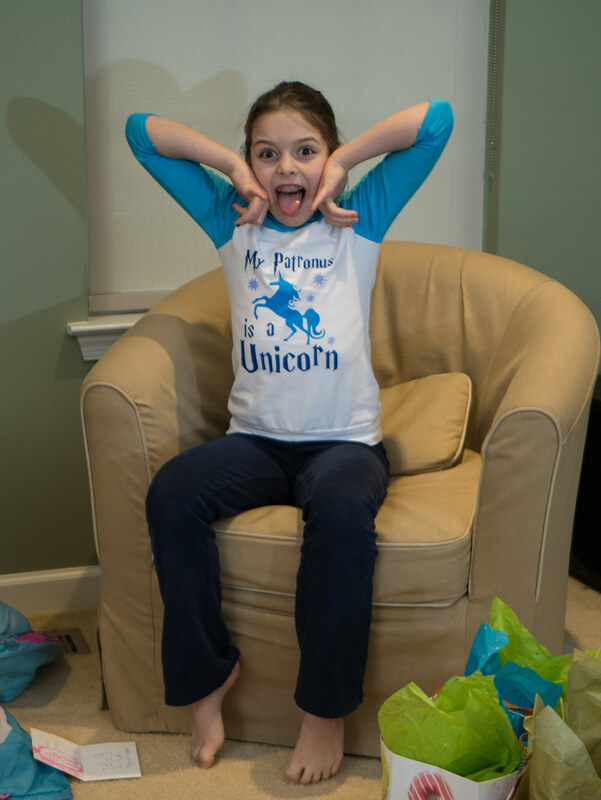 Molly’s also a huge Percy Jackson fan, having read the entire Olympians series, Heroes of Olympus series, and Kane Chronicles. 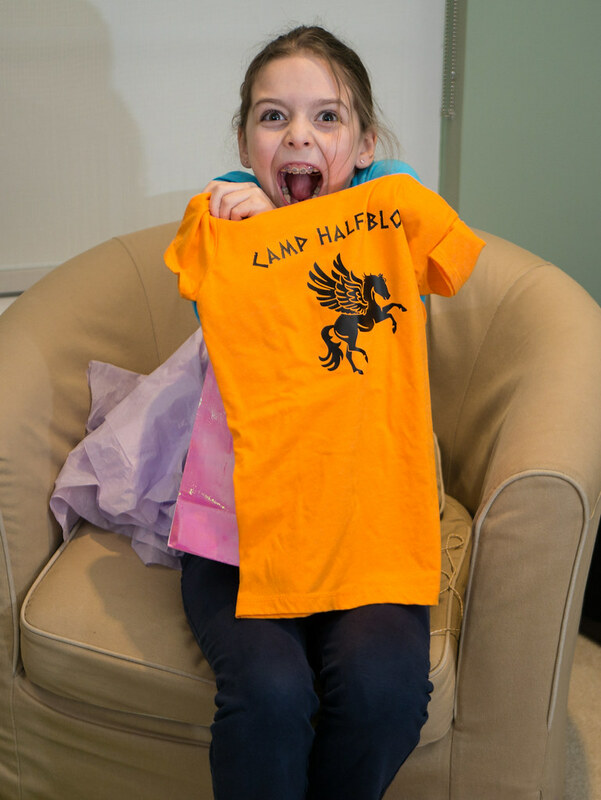 So I came up with the idea of getting her a Camp Half-Blood shirt (what all the demigods there wear). Jen did some research and made one. Molly was ecstatic. Cupcakes were had once again (this time full size ones). 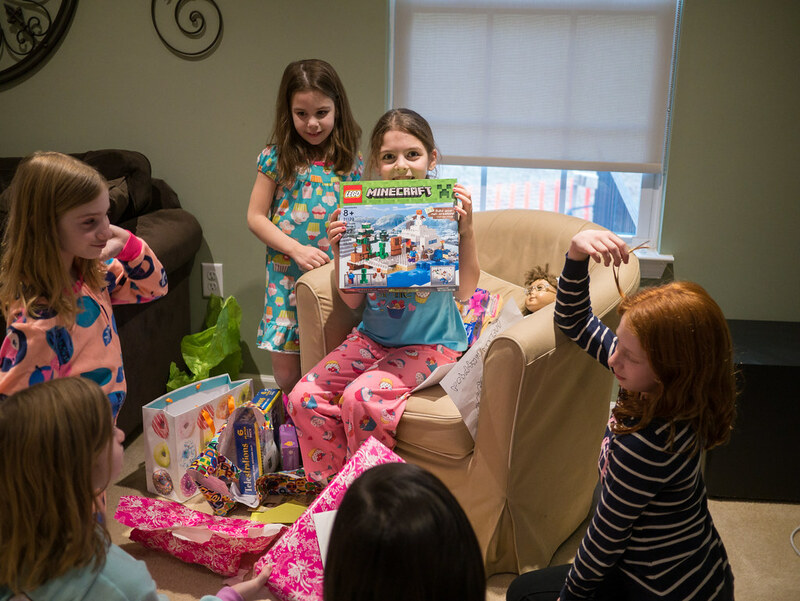 Molly had a slumber party for her 10th birthday, and she decorated for it herself. Here’s a tour of the event as the party gets started. 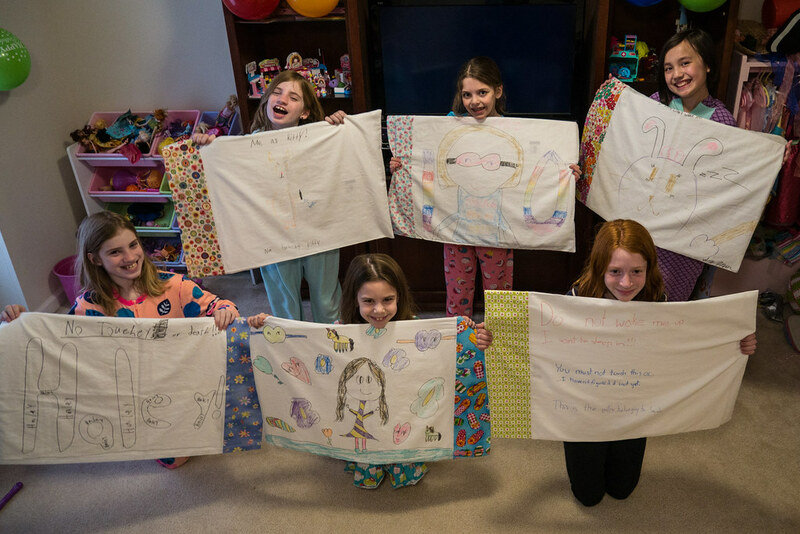 When the girls arrived, they got to decorate a pillow case with fabric markers (Jen had made the pillow cases ahead of time for them to use). 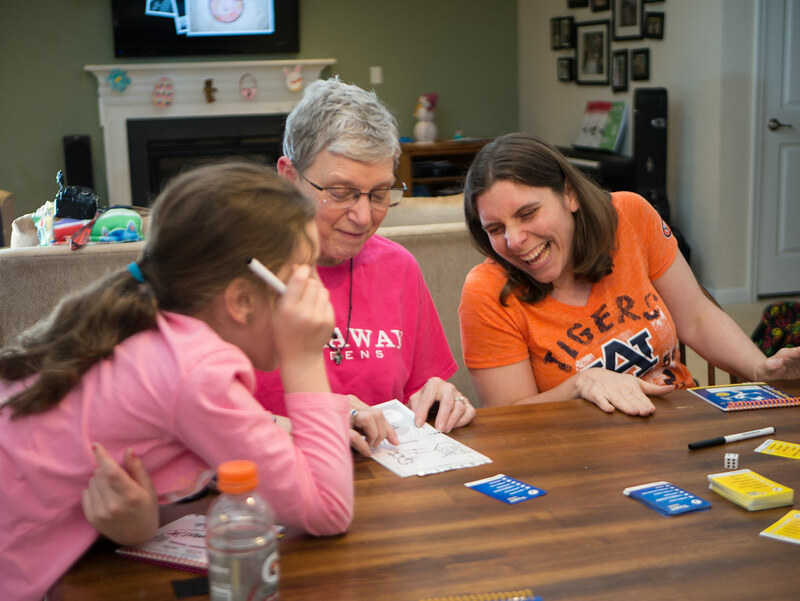 Jen played Spoons with the girls while I ran to Ledo Pizza to pick up dinner. Everyone had pizza for dinner (well, 2 of the girls didn’t like pizza so they chose to have cereal instead). 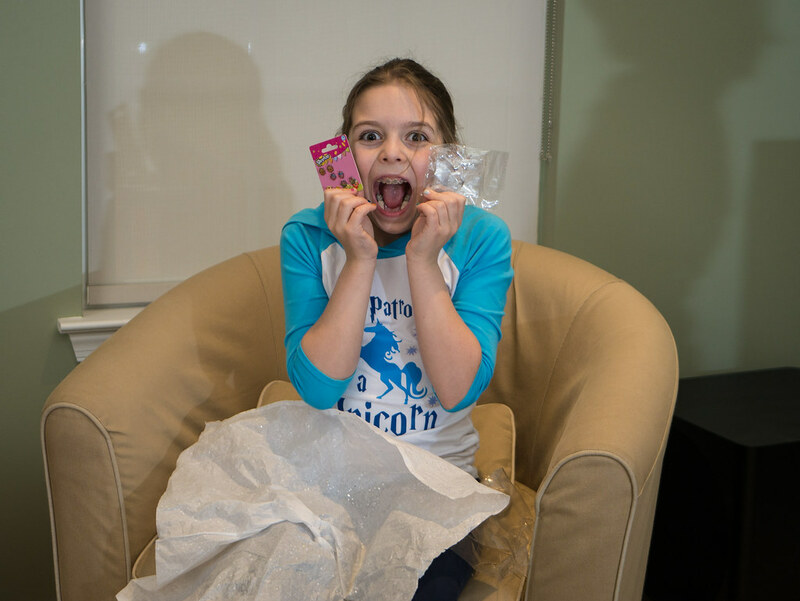 Then we opened presents. 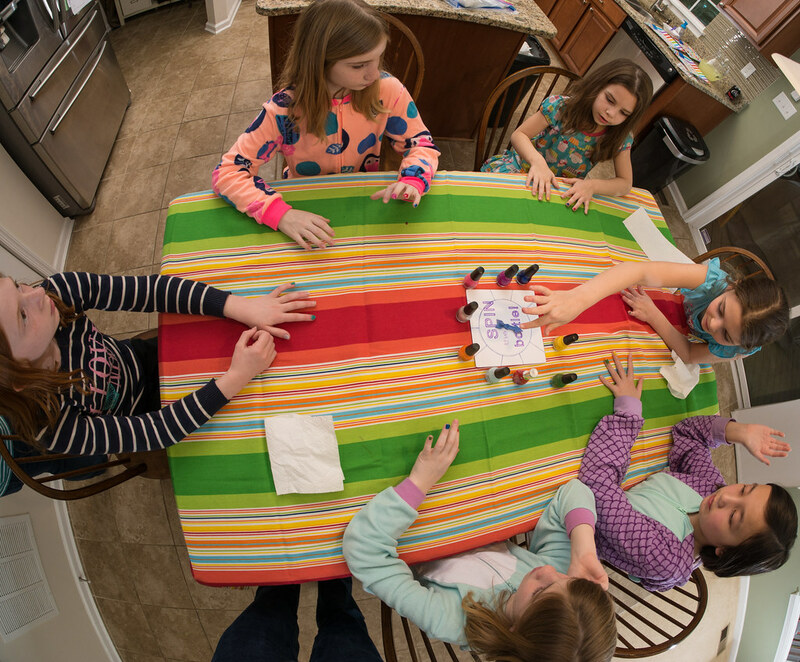 The girls played a version of Spin the Bottle with nail polish. 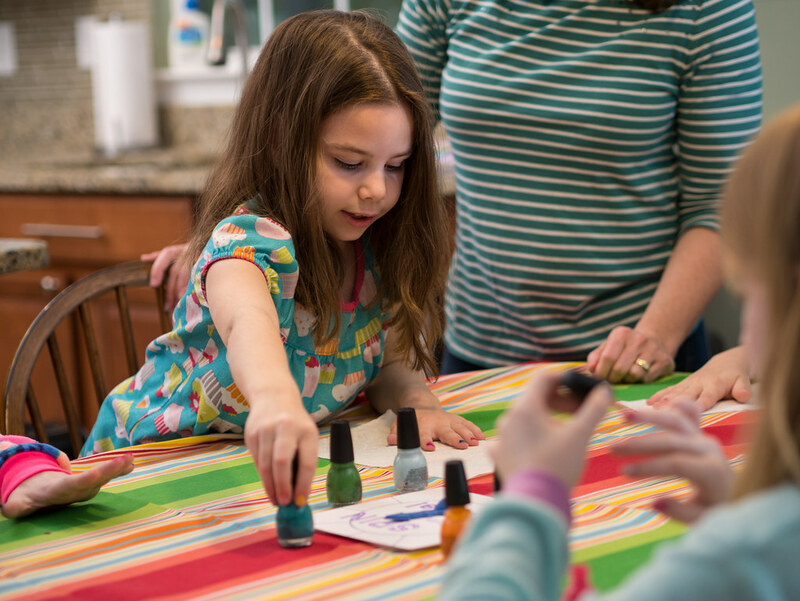 Each round, they each spun the spinner and then painted one of their nails with the color it landed on. They all ended up with a rainbow of colors on each hand. Next we did cupcakes, which was both a craft and a treat. Jen baked a bunch of mini cupcakes, made some icing, and put a bunch of toppings on the table. The girls then got to decorate 4 mini cupcakes each. It was tough holding them back from eating them until we sang to Molly. 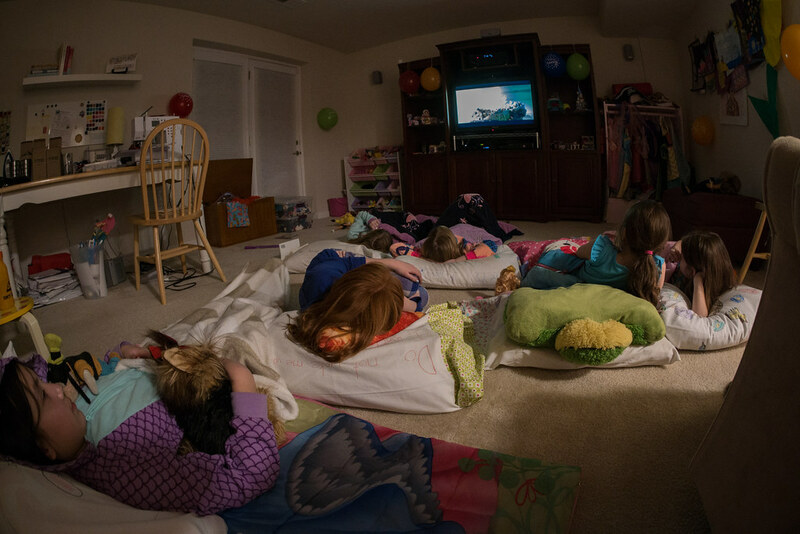 The final activity of the night was to watch a movie (Trolls). 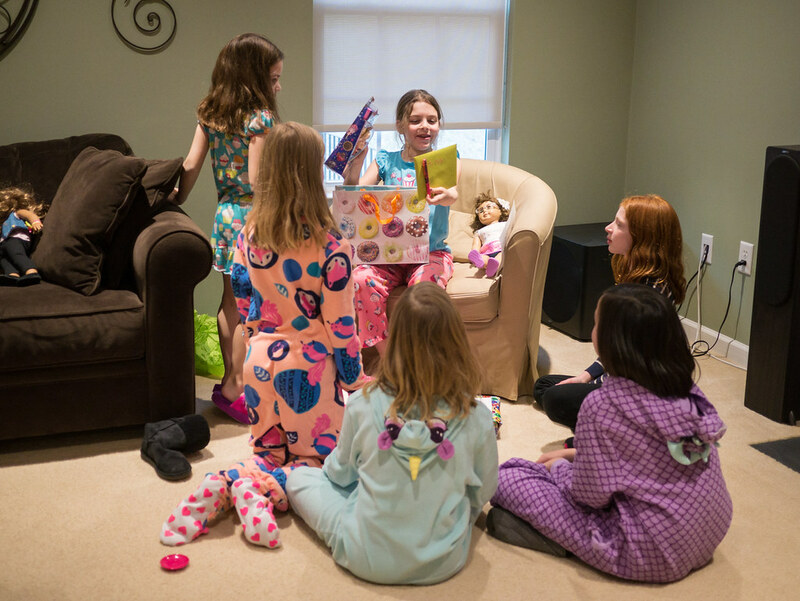 The girls didn’t exactly go to sleep right away, and there was some trouble when some were trying to go to sleep while others were trying to prevent that, but they at least all got to sleep around 11:00. The next morning we had Krispy Kreme donuts for them. They were from the grocery store and convenience store, sadly, as we have no Krispy Kreme near us any more. They were still delicious. Then two of the girls went home, while the other two and Molly all went to karate together.